Recently, Sea Sanctuaries Trust volunteers thought they had discovered a new species of Snake in the jungles of West Papua. We are very happy to hear the news that an entirely new species of Monitor Lizard has been discovered nearby too!.. Sam Sweet, a professor in the department of Ecology, Evolution and Marine Biology at UCSB, and Valter Weijola, a graduate student at Abo Akademi University in Turku, Finland, are the first to describe the distinctive lizard, which lives in the Moluccan islands of east Indonesia. Sweet is an authority on monitor lizard biology. The scientific name of this lizard is Varanus obor; its popular names are Torch monitor and Sago monitor. It's called Torch monitor because of its bright orange head with a glossy black body. Obor means torch in Indonesian. It is a close relative of the fruit-eating monitor lizard recently reported from the Philippines. The Torch monitor can grow to nearly four feet in length, and thrives on a diet of small animals and carrion. The Torch monitor exists only on the small island of Sanana in the western Moluccan islands. A unique aspect of this geographical region is the lack of mammalian predators, which may have given reptiles the space to evolve as the top terrestrial predators and scavengers. Several million years ago, this island was situated near New Guinea, and it is possible that the lizard lives on as a relic from that period. It is the only black monitor in its lineage, and the only monitor species anywhere that has evolved red pigmentation. 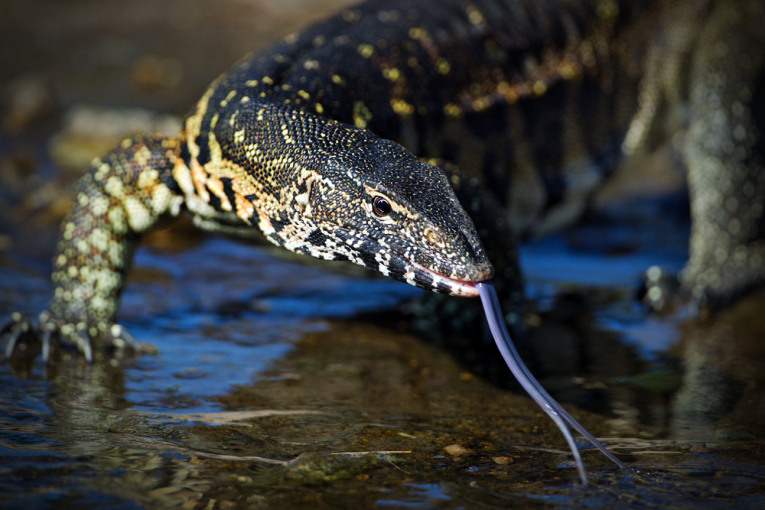 Sweet describes an important biological context: "East of Wallace's Line -- the boundary between Asian and Australian domains -- there are no native carnivorous mammals, and monitor lizards fill that role. There are more species there, doing more different things ecologically than in Africa or South and Southeast Asia, where competition and predation by mammals tend to keep monitor lizards down. East of Wallace's Line in Indonesia, New Guinea, and Australia, monitor lizards are on the top of the heap. It emphasizes again how little we know about some tropical regions, to find an animal so strikingly colored and so large only last year." Weijola discovered the lizard last spring, and returned with Sweet in late 2009 for five weeks to do studies and take photographs of the animal. The Torch monitor is most common in the coastal sago palm swamps and belongs to the mangrove monitor, V. indicus group.